A Guggenheim retrospective of László Moholy-Nagy examines the full breadth of the Bauhaus artist’s oeuvre. 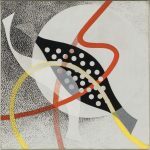 László Moholy-Nagy, A 19, 1927, oil and graphite on canvas, 80 x 95.5 cm. 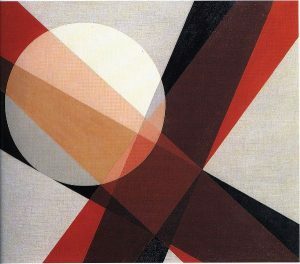 László Moholy-Nagy, A II (Construction A II), 1924, oil and graphite on canvas, 115.8 x 136.5 cm. László Moholy-Nagy, Photogram, 1941, gelatin silver photogram, 28 x 36 cm. As a result, many of Moholy-Nagy’s works deal quite literally with light, both as effect and product. His photograms, which are perhaps his most widely-known works, are cameraless photographs in which light-sensitive paper is exposed with objects layered on top of it, producing a ghost-like record of the objects and the movement of light through them and around them. Moholy-Nagy’s kinetic sculpture Light Prop for an Electric Stage (1929–30) creates light architecture, producing patterns and reflections in the space around it. His experiments with oil paint on incised Plexiglas—such as B-10 Space Modulator (1942) or Papmac (1943)—rely just as much on the transparency of Plexiglas, or rather, the material’s ability to simultaneously reflect light and let it permeate it, as they do on the colors and forms of the paint. 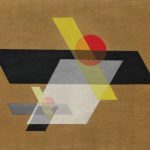 Examples of these works will be on view at “Moholy-Nagy: Future Present,” a major retrospective of the artist, which opens at the Solomon R. Guggenheim Museum in New York on May 27 (through September 7). Co-organized by the Art Institute of Chicago and the Los Angeles County Museum of Art (the show travels to the former in October and the latter in February), the exhibition amasses some 300 works from public and private collections in Europe and the United States, including paintings, photographs, film, documents, and ephemera. The first retrospective of the artist in America in 50 years, the show is not only a momentous occasion for scholarship and the conservation of Moholy-Nagy’s work, but also a rare opportunity to see so many of the artist and teacher’s thoughts and experiments at once. 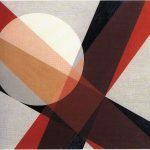 After being discharged from the army, Moholy-Nagy returned to Budapest and focused his energies toward becoming a painter, creating paintings driven by harsh lines and primary colors. Disillusioned with the Communist regime he once supported for its inability to use nonrepresentational art as a revolutionary weapon, the artist briefly relocated to Vienna. Already embracing a Constructivist approach, Moholy-Nagy found no contentment among the Symbolists and Expressionists in the Vienna cafés, and in 1921 he arrived in Berlin. In these early years in Germany, Moholy-Nagy met Kurt Schwitters, the German artist who created his own style of Dadaism called Merz. Schwitters impressed upon Moholy-Nagy the potency of humor in political collage and an interest in typography, more specifically the disassociation of letters from their formal uses in the alphabet. Moholy-Nagy’s fascination with typography would persist throughout his career, but manifested itself in 1921 in the canvas Gelbe Scheibe, 1921 (Yellow Disc, 1921), in which the artist arranged the letters of his name MOHOLY as a Constructivist experiment. 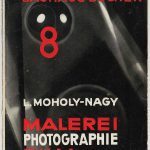 Soon afterward, Moholy-Nagy discovered the photogram. 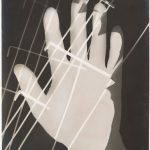 Embracing the Dadaist assertion that any material was of pictorial worth, Moholy-Nagy captured kitchen utensils, household objects, plants, fruit, and body parts, namely hands (Photogram, 1941, which appears in the show, is one such example). 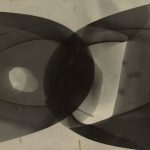 Through the photographic process and the making of photograms in particular, the artist was able to achieve the “concretization of light phenomena,” and represent visually the way light moves through space. He wrote in the catalogue of his first photo exhibition in 1923: “The photogram is the realization of spatial tension in black-white-gray. Through the elimination of pigment and texture it has a dematerializing effect. It is writing with light.” The artist believed that just like a Constructivist painting, the photogram was capable of “evoking an immediate optical experience” and thus constituted a supreme form of both art and information. Throughout the rest of his career, Moholy-Nagy would champion he photographic medium through his work, writing, and teaching. Moholy-Nagy joined the faculty of the Bauhaus in Weimar in the spring of 1923. The school’s focus on an interdisciplinary practice, which fused the practical creation of craft and an analysis of material and form within the fine arts, gelled with the artist’s pre-established beliefs and helped to push his work forward. There, he furthered his investigation of photography, typography, and painting and explored printmaking and industrial design, while also solidifying his interest in pedagogical theory. He left the school in 1928 and enjoyed success in Berlin as a commercial artist, exhibition and stage designer, and typographer. After the Nazis came to power, Moholy-Nagy fled with his family to the Netherlands and then to London. He finally relocated to Chicago in 1937 and never returned to Europe again. There he became the director of the New Bauhaus, a school which functioned on the same tenets as the German original. A year later, the New Bauhaus lost its funding and closed. In 1939, Moholy-Nagy opened the School of Design, which became the Institute of Design in 1944 and became a part of the Illinois Institute of Technology in 1949, three years after Moholy-Nagy died of leukemia.